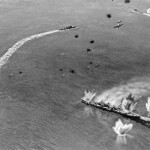 Life magazine, with the help of the USN, commissioned the construction of an incredible series of gigantic dioramas that illustrated the various events and phases of the Battle of Midway. 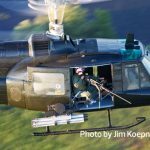 While preparing Barrett Tillman’s exhaustive article on that operation in this issue, our own Stan Piet stumbled upon what appears to be the entire file of Bel Geddes photos. So, we put him to work arranging and captioning each so we could present them to our readers. 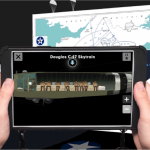 It’s a fascinating, educational way to look at one of the most pivotal battles of WW II. 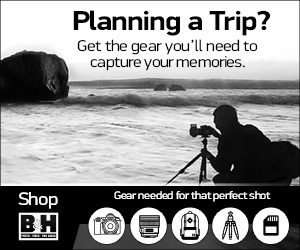 Clicking any image will launch the slideshow. 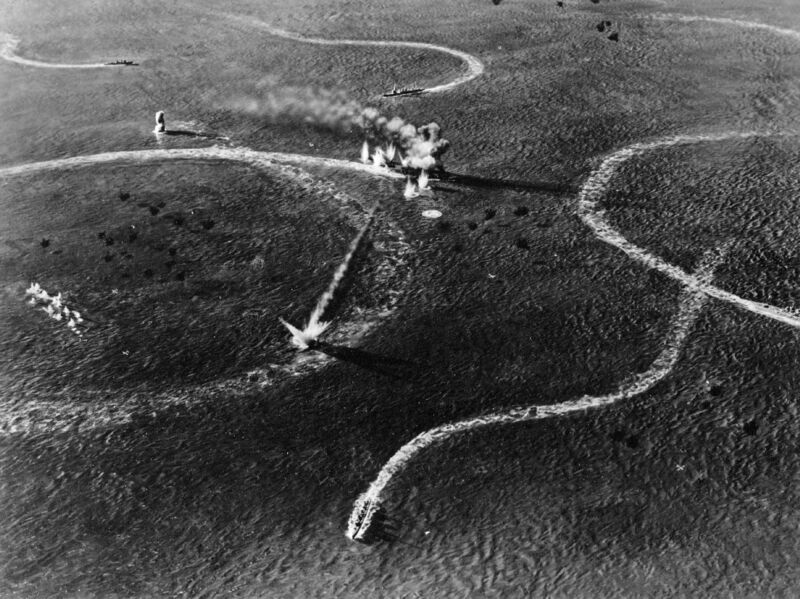 Defensive Positioning: Although the Japanese carrier attack was expected from the west or northwest, Midway’s defenders kept a long-range recon force of 22 of the 32 available PBY-5s positioned to cover its various approaches. 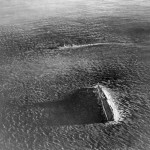 Contacts were made with several enemy vessels with one PBY scoring a torpedo hit on an oiler shortly before 0200 June 4. 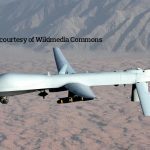 Subs and destroyers along with Army B-17s and shorter range fighter aircraft also ringed the likely patrol areas waiting for possible contact. 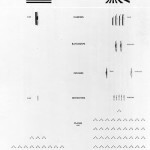 Belle Geddes Midway Model-Attacking Forces: The Belle Geddes simulation started his Life Magazine presentation with a representative graphic of the attacking and opposing naval force available to the battle. 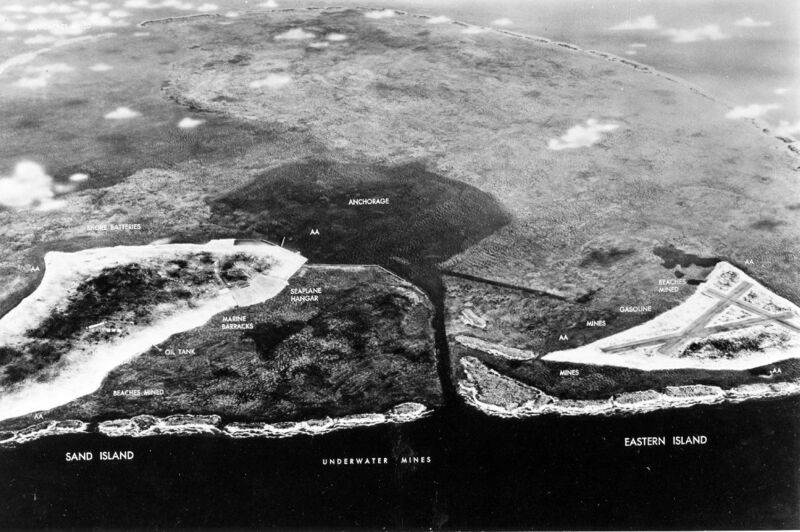 Midway Island Defenses: This graphic shows Midway Atoll’s defensive positions on Sand and Eastern Islands as of June 3rd. 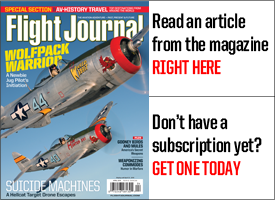 With prior knowledge of Japan’s intent to invade and occupy Midway the US military beefed up its local defensive force to 121 aircraft and additional Marine ground forces. 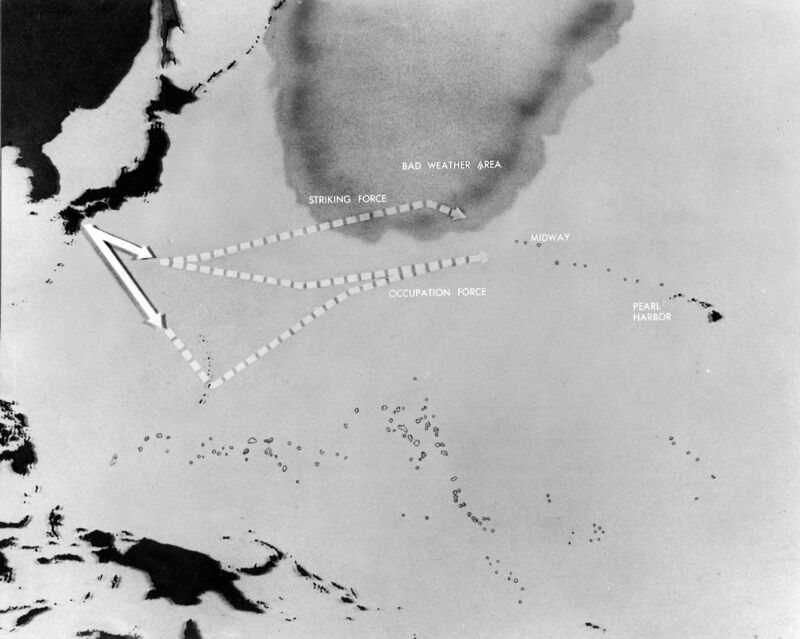 Attacking Force Midway: Admiral Yamamoto’s battle plan for his carrier (Kido Butai) and invasion strike force employed a two-pronged assault on Midway Atoll along with a diversionary raid on Dutch Harbor with occupation of Kiska and Attu Islands beginning on June 3rd. 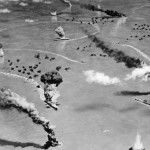 With their ultimate intention to destroy America’s carrier fleet as the goal, their initial strike would be from Vice Adm. Nagumo’s First Air Fleet’s four carriers’ aircraft to attack Midway’s facilities to destruction beginning June 4th. 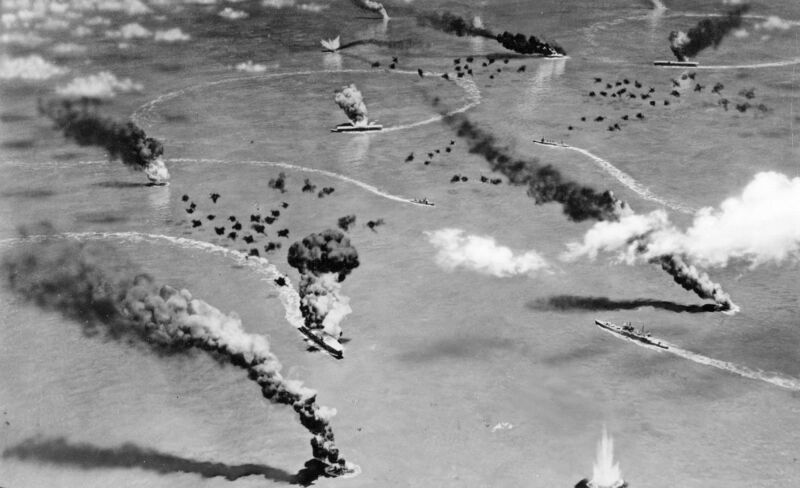 With Midway suppressed and air superiority achieved the invasion force would storm Midway’s defenses to deny the island’s future use to the US Navy and to assert a ready threat to Hawaii and the Aleutians. 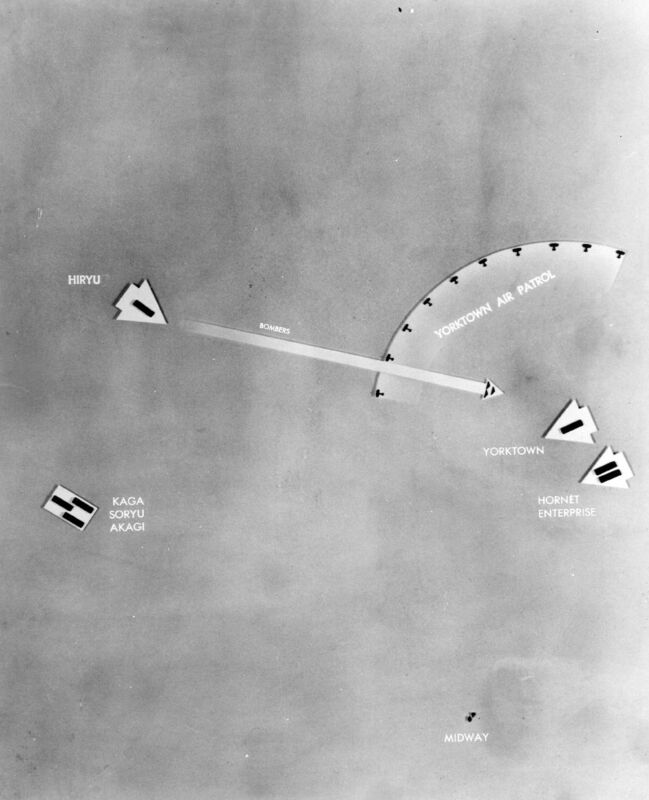 efensive Positioning: Although the Japanese carrier attack was expected from the west or northwest, Midway’s defenders kept a long-range recon force of 22 of the 32 available PBY-5s positioned to cover its various approaches. 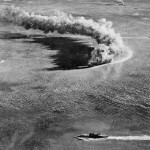 Contacts were made with several enemy vessels with one PBY scoring a torpedo hit on an oiler shortly before 0200 June 4. 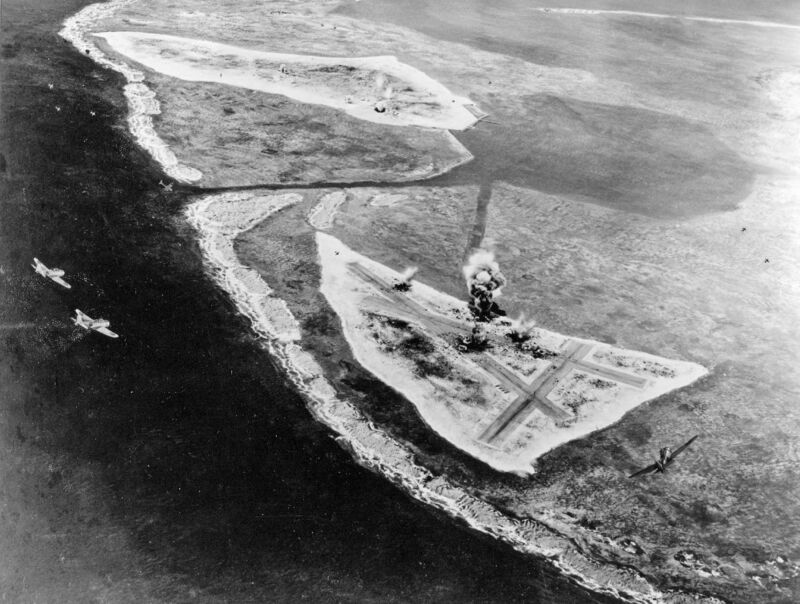 Subs and destroyers along with Army B-17s and shorter range fighter aircraft also ringed the likely patrol areas waiting for possible contact. 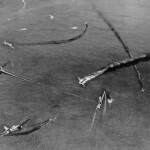 Initial Contact: Opposing forces began their air assaults well before dawn of June 4th as Nagumo’s first wave of 108 aircraft was heading to Midway by 0440 with a second wave of 105 more being readied to confront any shipping threat. Float planes were also launched to search for the suspected American task forces. 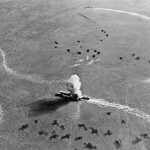 Prior to this, sixteen B-17s were sent west to find and attack the transports. 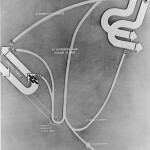 The American carriers’ planes were readied as they awaited contacts that started to arrive from the PBYs at 0534 of enemy carriers and approaching planes. 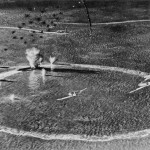 Carrier and Midway fighters and bombers were soon launched to seek out the various elements of the Japanese attack and to intercept the attacking force heading towards Midway. 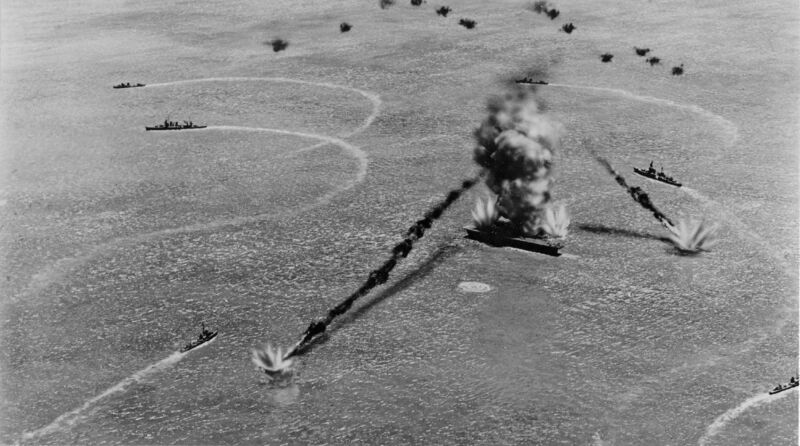 Fighter Contact: Midway’s radar picked up Nagumo’s strike just before 0600. 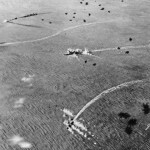 Midway smartly launched all its available aircraft to meet the attack that kept them from ultimate destruction. 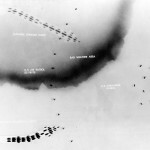 Marine fighters from VMF-221 intercepted the bombers but poor tactics and swarming Zero’s decimated their ranks leaving Midway without fighter protection. 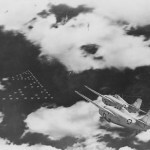 The other aircraft headed for the now located fleets with VT-8’s eight TBF-1s, Marine Dauntlesses, along with Army B-26s and B-17s. 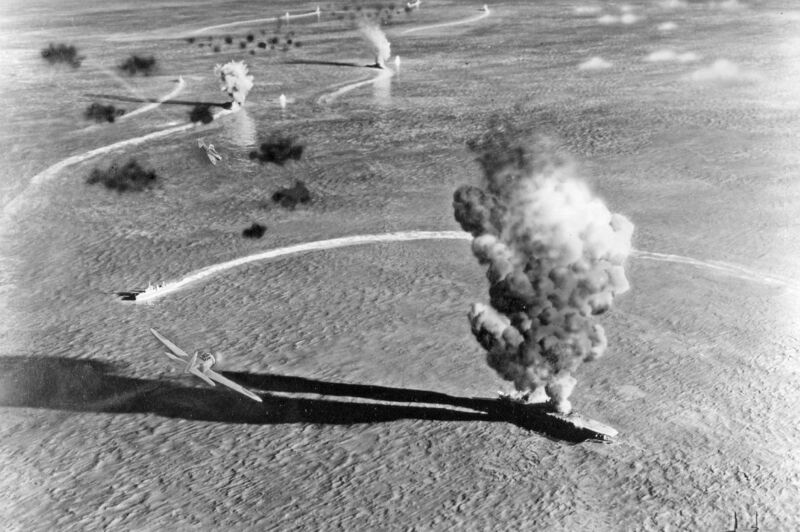 Jap Attack Airfield: With no viable fighter cover Midway was heavily pummeled by level and dive bombers. 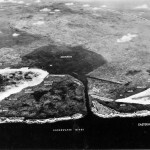 Eastern Island’s three runways were cratered with the attackers also taking out hangars, ammunition storage and petroleum storehouses. 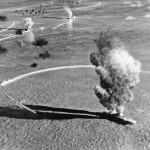 Jap Attack Sand Isl. 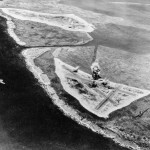 : Sand Island, which housed most of the Atoll’s facilities, also saw extensive damage including the base hospital and power station. 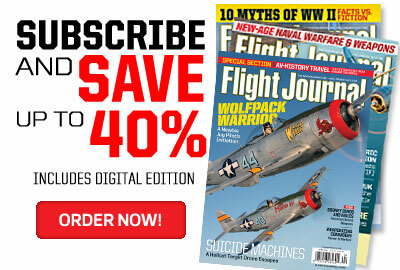 Although seriously wounded Midway’s defenders were still potent shooting down 15 of the attackers. 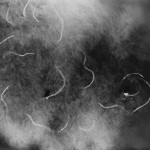 The Japanese air commander sent back word that a second raid was indicated. 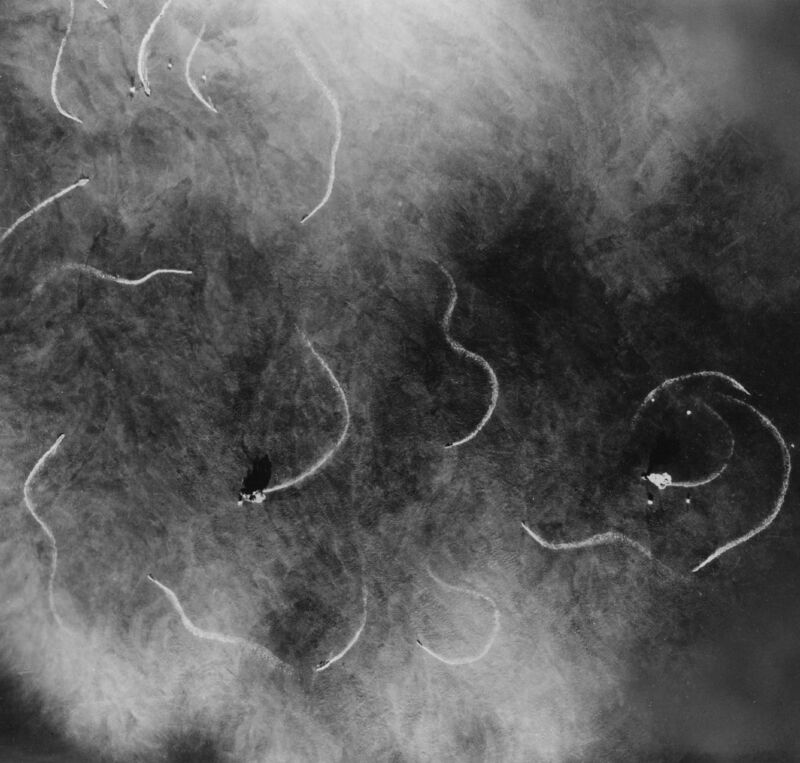 Yorktown Attacked: The Japanese soon had their vengeance after losing two carriers in the early morning. 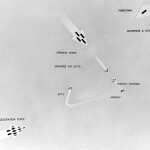 The virtually untouched Hiryu launched eighteen Vals and six Zeros northeast finding TF-17’s location right before noon. 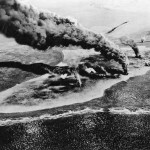 Torpedo Dive Bombers Attack Jap Fleet: Midway’s mixed defensive force reached the Attack Force around 0700. 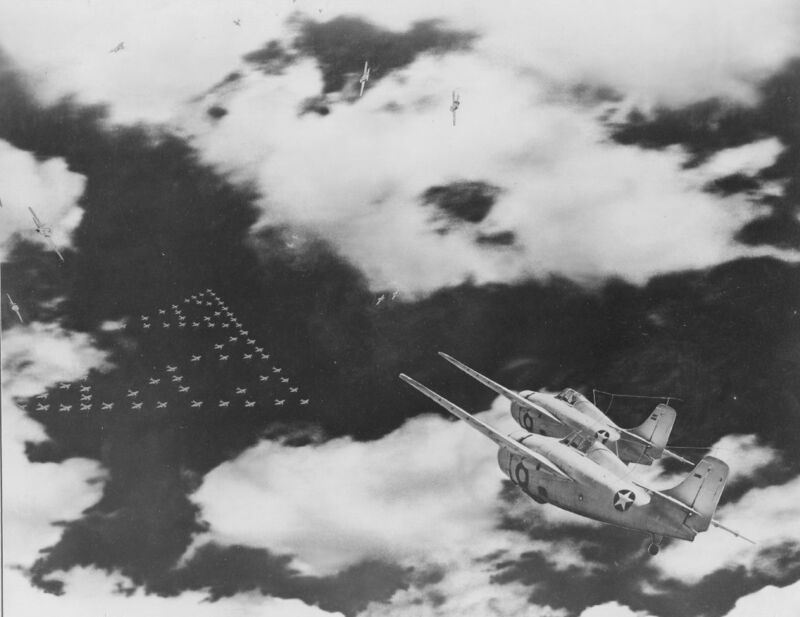 First in was the untested detachment of eight Grumman TBF-1 Avengers from VT-8 attacking the Akagi. 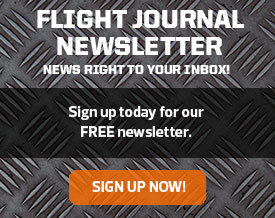 No hits were scored with only one aircraft barely returning. 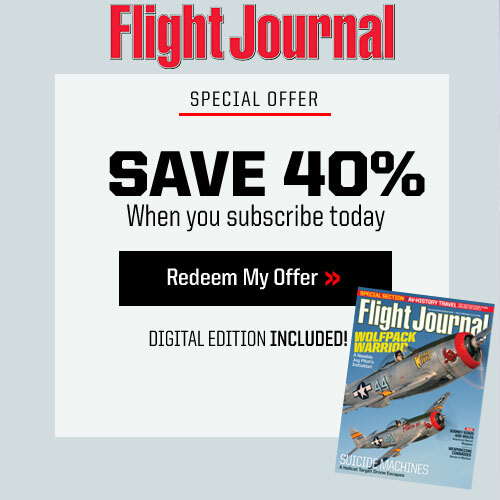 Next in were four torpedo-equipped Martin B-26s that also exited scoreless. 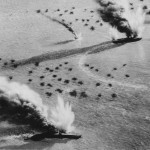 Behind them were Marine SBDs bombers from VMSB-241 that attempted gliding attacks on the Hiryu with no success and finally Marine Vindicators went after two battleships coming up empty-handed. 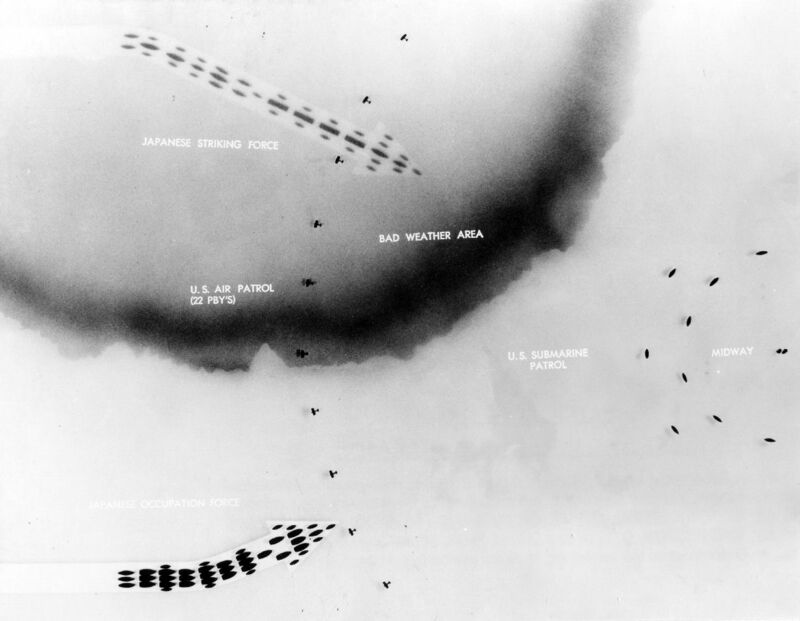 Jap Fleet Maneuvers from Bombing Aircraft: This overhead view shows the Attack Force’s avoidance maneuvering during the initial contact of Midway’s bombing groups. 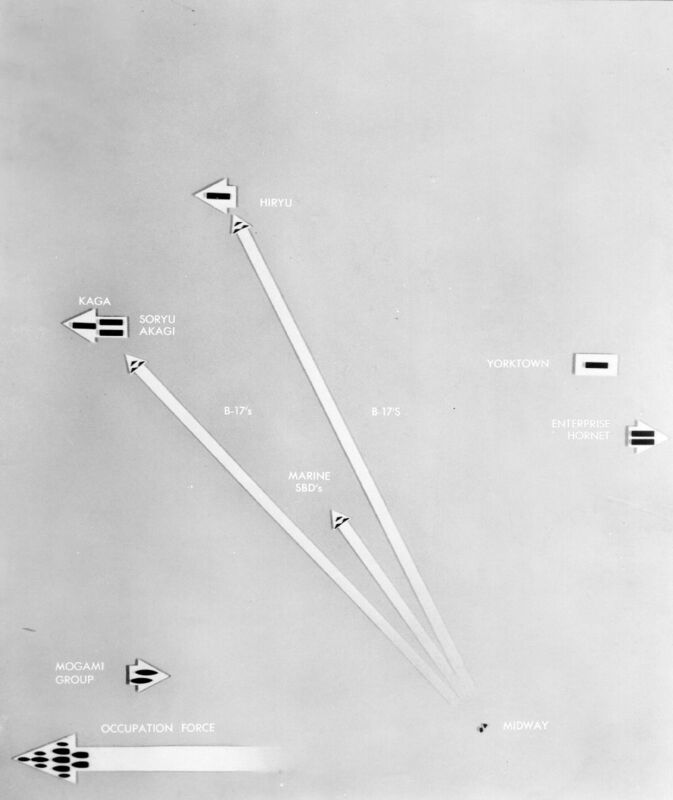 Attacking Carrier Planes: This graphic show the carrier attack groups from the Enterprise and Hornet’s search and attack positions with their force structures and the retreating paths of their surviving aircraft. 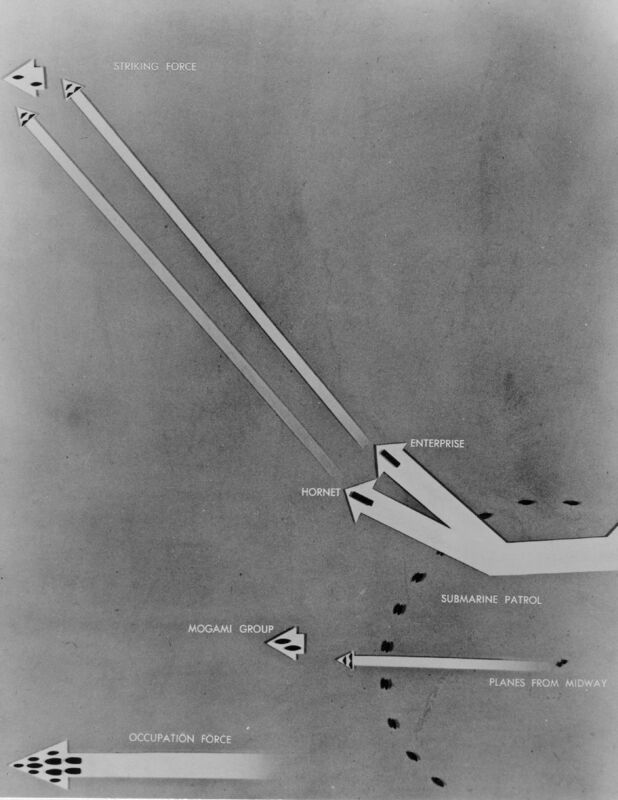 Yorktown Torpedo Planes Attack Akagi & Soryu: After unsuccessful assaults by the Enterprise and Hornet’s vulnerable TBDs, a final Devastator sortie from Yorktown’s VT-3 under command of Lt. Cmdr. Lance Massey escorted by top cover of F4F-4s led by Lt. Cmdr. Jim Thach headed towards the Akagi. 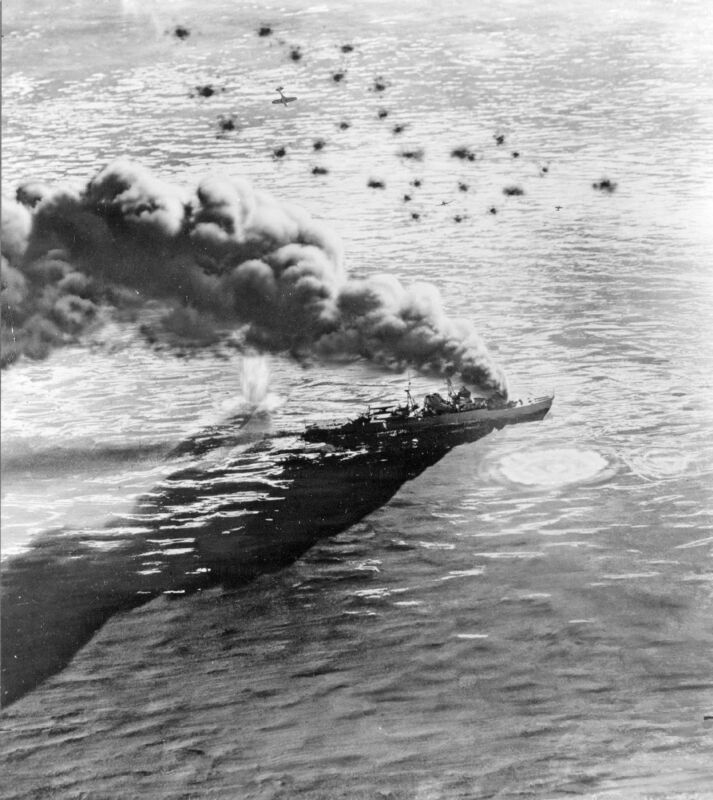 Swarms of Zeros engaged the Wildcats and diverted VT-3 towards the Hiryu again scoring no hits with the loss of all but two TBDs. Overhead, though, SBDs from Lt. Cmdr. Max Leslie’s VB-3 found the Soyru ripe for the picking and although stymied by faulty arming electronics Leslie’s charges managed to delivered three well placed bombs across her deck. 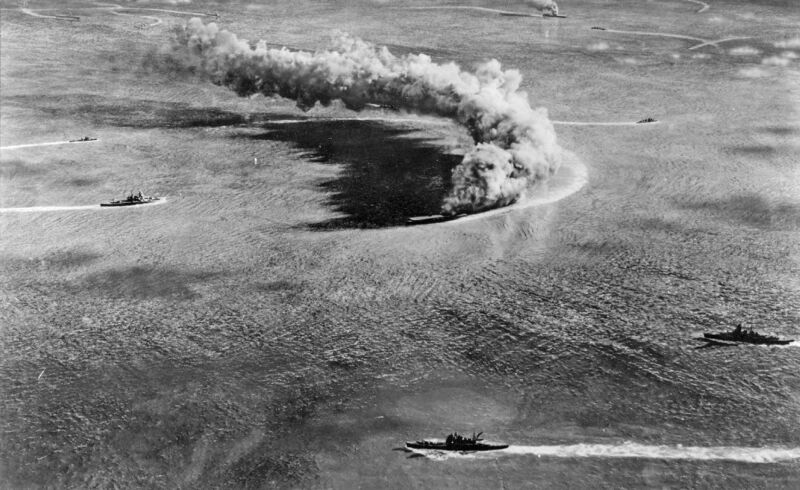 Aircraft scattered amongst bombs, torpedoes and fuel hawsers burst into a holocaust of destruction bringing Soryu to abandon ship in 15 minutes. She sank five hours later. 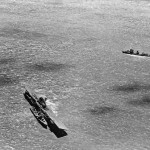 CV-5 & 6 Attack Lose 20 -6 Return AC 10-22: As VT-3s unsuccessful attack brought the defending A6M-2s down to sea level and occupied the fleets gunners SBD’s from both CV-5 & CV-6 SBDs arrived overhead. 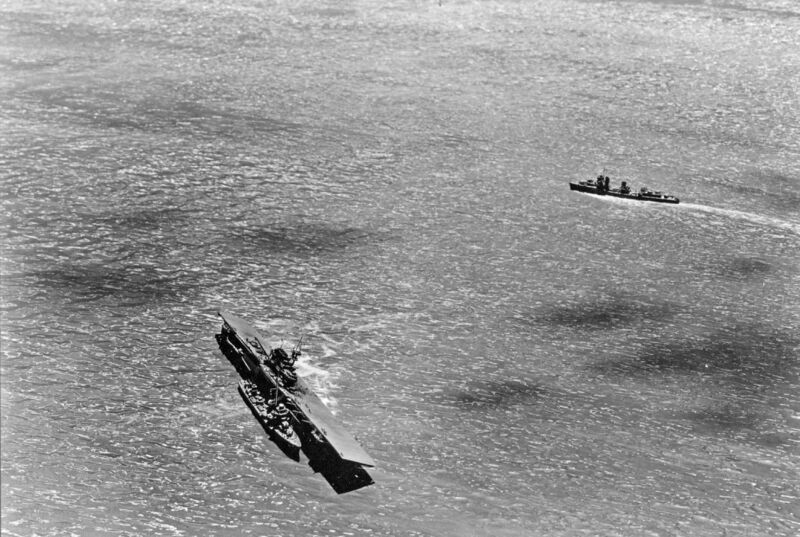 Although low on fuel from an almost fruitless search they rightly followed a steaming destroyer right to the center of the Japanese carriers. 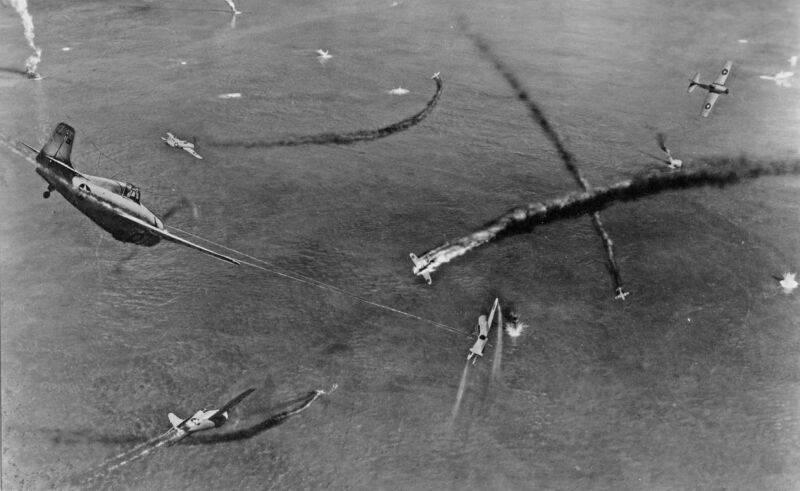 Elements from VB-6, VS-6 and VB-3 quickly nosed over and took on Akagi and Soryu and Kaga. 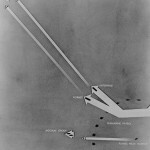 Caught with returning aircraft on their decks and with readied aircraft below strewn with unsecured ordinance and fueling lines all three carriers were doomed within 6 minutes. The pride of Japan’s carrier fleet was gone in the blink of an eye. Nautilus Torpedoes Kaga 11:59: Commissioned in 1930 SS-168, later named USS Nautilus, was assigned her first war patrol to repel the Midway invasion. 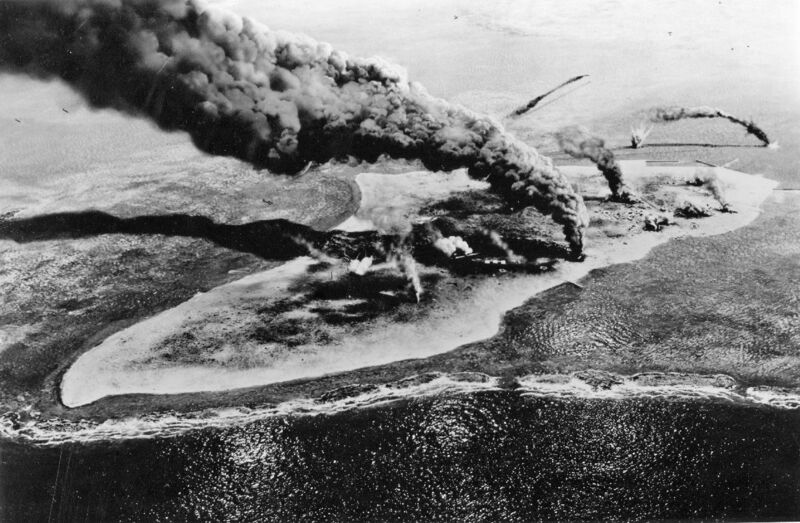 Just before 0800 on June 4th she sighted elements of the Attack Force but was immediately located by enemy aircraft and was pursued by air and naval forces for two hours firing two torpedoes at the battleship Kirishma unsuccessfully. 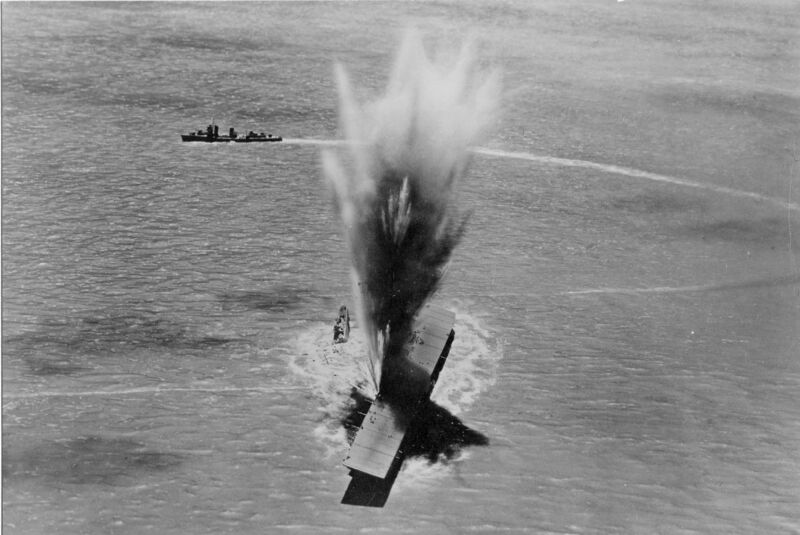 Later in the day she located the burning wreck of the Kaga and unloaded four Mark XIV torpedoes at her virtually abandoned wreckage. 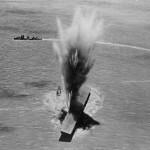 Only one of the unreliable Mk XIV’s hit her amidship but failed to explode. 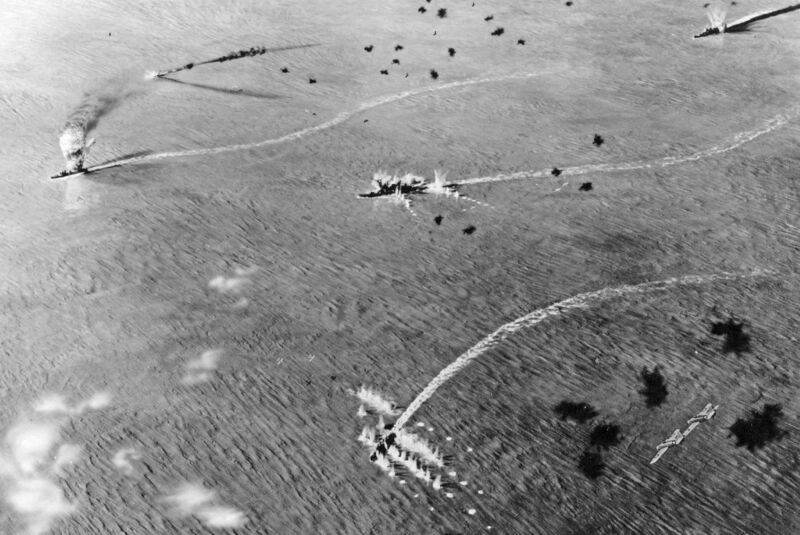 CV-5 Shoots Down Attacking Fighters: Eight of the dive bombers were quickly dispatched by the Wildcat defensive screen and another two by flak but the accompanying top cover of Zeros were able to keep the F4Fs occupied enough to allow a handful of Vals to unleash their bombs against the wildly maneuvering Yorktown. 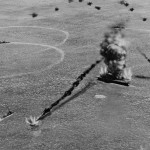 Yorktown 3rd Hit-Comes to Stop 12-13: In a short 15 minute engagement Hiryu’s dive bombers scored three hits on CV-5. Yorktown quickly came to a crawl but fortunately the attackers were expended, allowing her a breather. 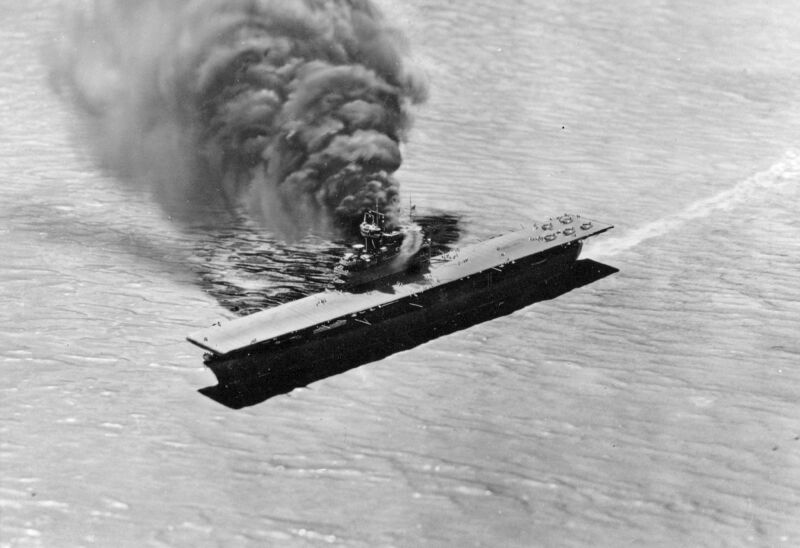 CV-5 Repairs Damage 12-30: Fortunately Yorktown’s crack damage control parties had her back underway able to maintain twenty knots within 20 minutes after the last bomb hit. 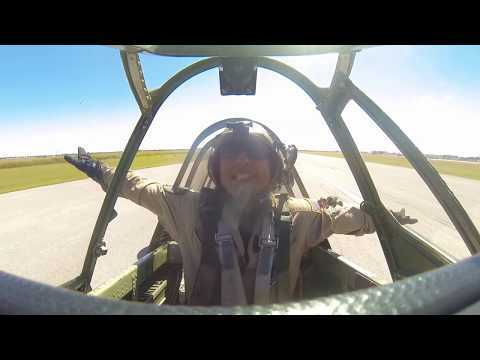 She recovered her F4F’s and readied for further action. 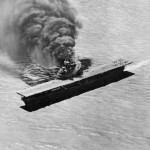 CV-5 Hit by Torpedo 1445: Yorktown’s earlier brush with destruction was again challenged by 10 Kate torpedo bomber from the still unscathed Hiryu around 1445. 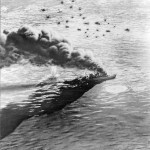 Six were quickly brought down by air cover and anti-aircraft defenses but several slipped through and succeeded in putting two torpedoes into her hull. Yorktown quickly lost power and began flooding asymmetrically putting her quickly into a 20+ degree list to starboard. With no power to change her list she successfully abandoned ship late afternoon. 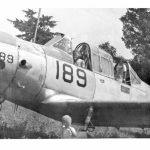 Hornet Planes Attack Hiryu 14-45: Hiryu’s successes against Yorktown were short-lived as a Yorktown scout aircraft found her around 1450 detached from the main body in a stage of refitting for another wave of attack. 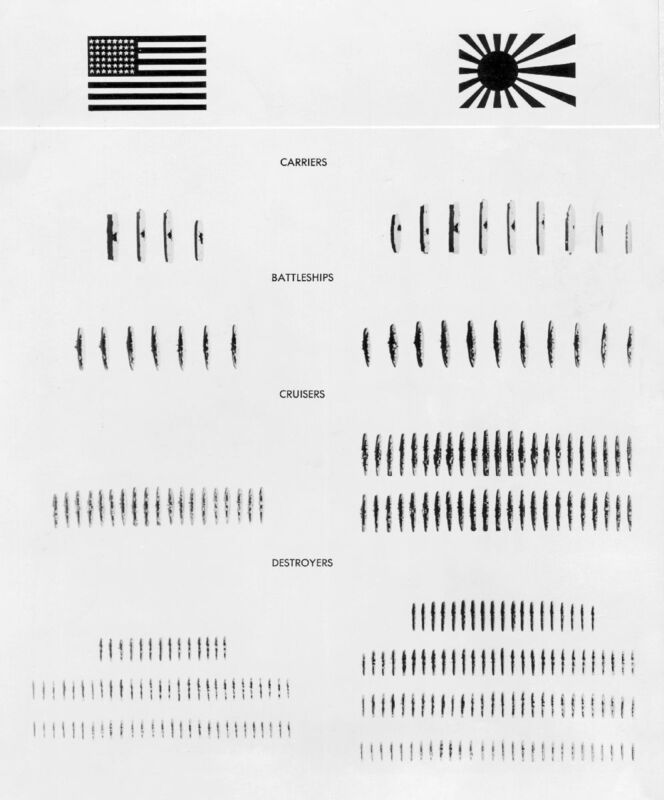 Word back to the Hornet and Enterprise sent out 24 Dauntlesses to take out the carrier and accompanying battleships. 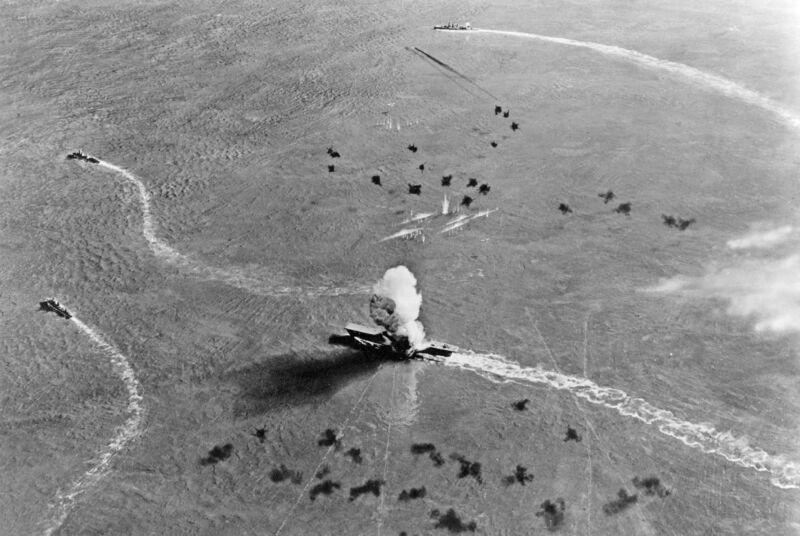 Although her 12 Zero combat air patrol Four bombs from the Hornet’s SBDs turned her flight and hangar decks aflame but not affecting her power plant immediately. Still at thirty knots she was quickly surrounded by her support ships to help quench the firestorm but to no avail. She abandoned ship later in the afternoon after losing all power. Her surviving crew rescued, she slipped under the water early on the 5th of June her commander deliberately going down with his charge. 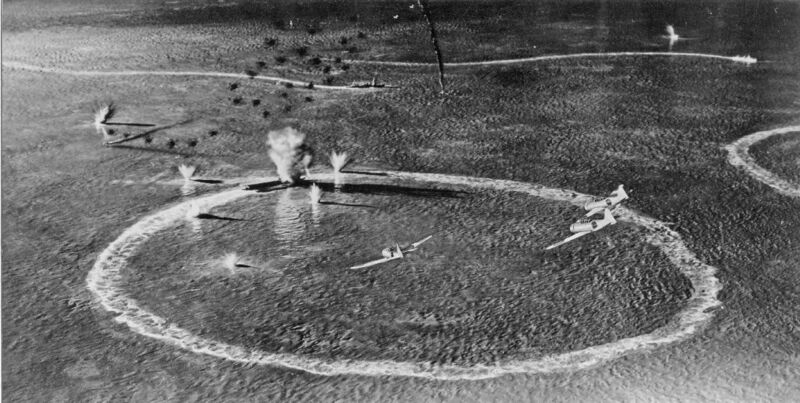 Battle Situation at Sunset 6-5: With five carriers attacked and abandoned on June 4th combat operations moved towards a new wave of attacks from Midway that included several waves of B-17 attacks at various attack levels and Marine dive and torpedo bombers sent out to find the remnants of the Japanese Attack convoy. 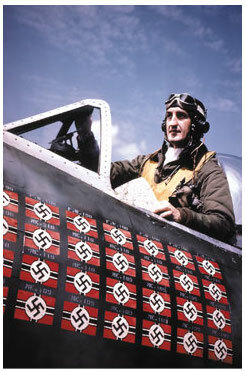 TF-16 also launched several waves of SBDs and F4Fs to the same end, all with mixed results. Yorktown is taken under slow tow by the USS Vireo (AT-144) heading back to Pearl Harbor. 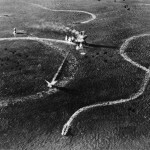 Mogami USMC SBD & SB2Us Attack from Midway 8-05: On the morning of June 5th Midway based forces again were back in action with the Marines taking off at 0700 in search of two enemy cruisers shadowed by the sub Tambor through the night. 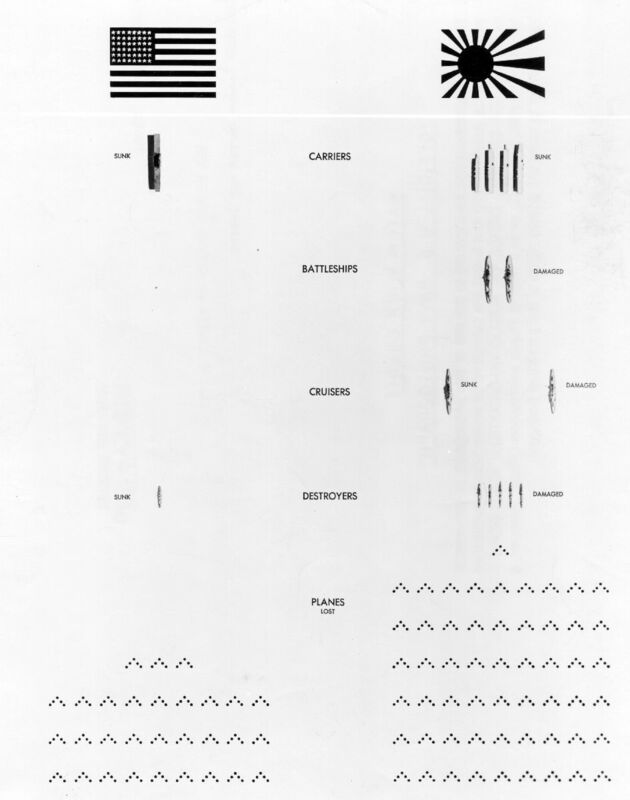 Previous siting of the US sub had caused a quick maneuvering of the cruisers Mogami and Mikuma resulting in a collision that heavily damaged the Mogami. 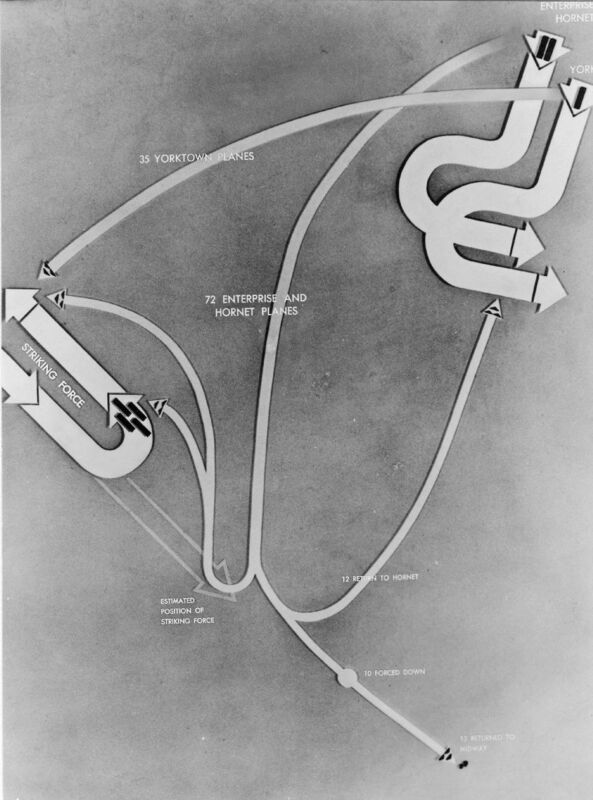 Both ships had been on way to bombard Midway but were recalled when the collision occurred and were in a slow retreat west when overtaken by the Marine Air groups. 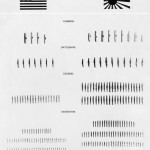 Several more attacks would be necessary to defeat the cruisers. Map End of June 5th : This panels show the highlights of the June5th’s events with the Japanese Attack and Occupation forces in retreat with TF 16 & 17 in pursuit. 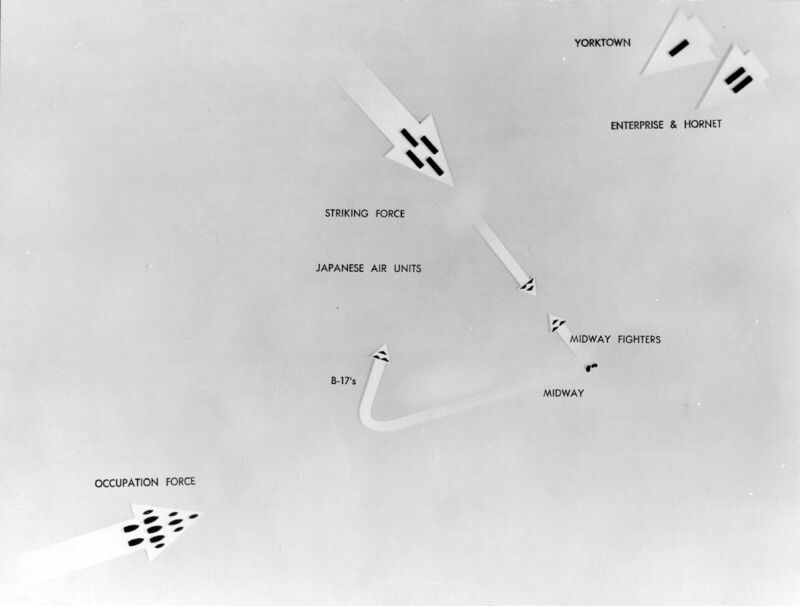 AC from Hornet Attack Mogami & Mikuma 6-6 at 9-50: Both surviving carriers along with Midway PBYs continued to scout out the retreating Japanese convoys beginning early morning of the 6th. 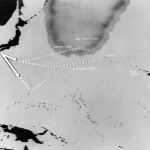 Mogami and Mikuma were soon located about 435 miles west of Midway with a screen of destroyers. 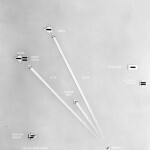 Hornet’s twenty-six SBDs hit a mixed group of cruisers and destroyers at 0950. One hour later Enterprise sent out another thirty-six Dauntlesses arriving over the Mikuma and Mogami sinking the former at 1150. 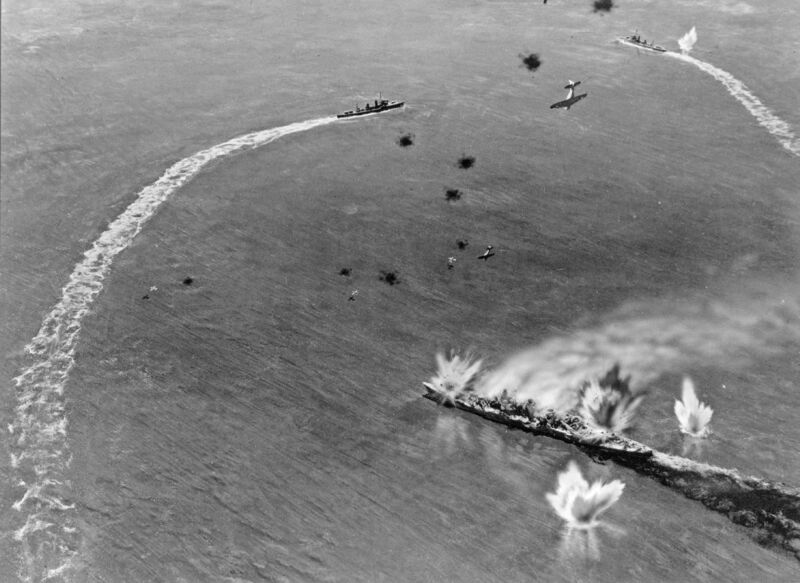 CV-8 bombers leave Moagmi Gutted 6-6 at 10:50: Mogami shudders under repeated attacks by Hornet’s carrier planes and limps back to Truk. 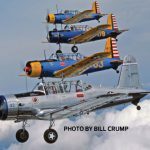 Camera equipped SBD brought back pictures of the two cruisers becoming some of the most famous images from the war. CV-5 Salvage Work 4-Torpedoes Approach 6-6 at 13-34: With dawn on the 7th CV-5 was found to still be afloat and a well-designed 170-man boarding party was delivered around noon with a protective screen of destroyers circling her position. An ocean-tug the USS Vireo (AT-144) was positioned to take CV-5 under tow and the USS Hammonn (DD-412) came alongside to provide power and pumping. 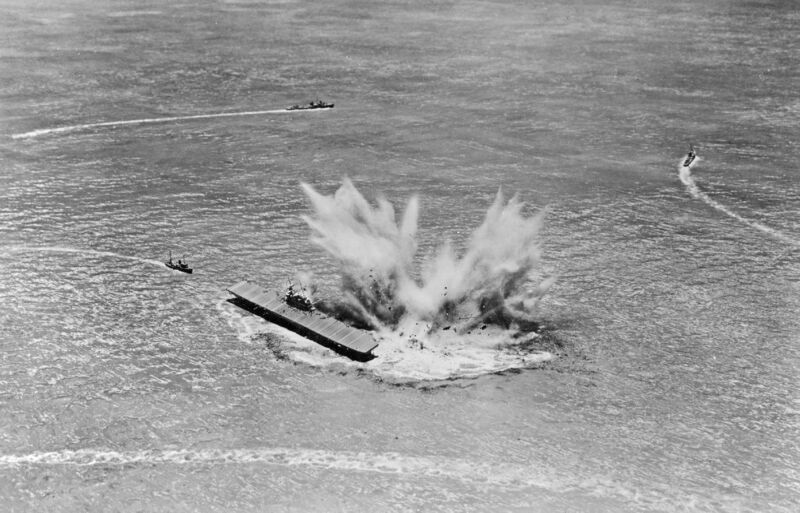 By 1330 their efforts began taking hold when the Japanese sub I-168 silently penetrated the destroyers net and sent four torpedoes towards the salvage scene. CV-5 & DD-412 First Torpedo Hits Yorktown 2nd Torp Hits Hammonn 6-6 at 13-36: Lookouts spotted the torpedo spread and Hammonn went to general quarters bringing her screws up to speed as a 20mm gun crew attempted to intercept the approaching destruction. 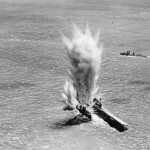 The first torpedo hit CV-5 at 1336 followed quickly by the second which impacted Hammonn dead center, effectively splitting her in half. 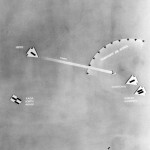 Torp Hits CV-5 at 13-37 Hammonn Sinks at 13-39: The third torpedo struck a minute later with the fourth missing CV-5’s stern. 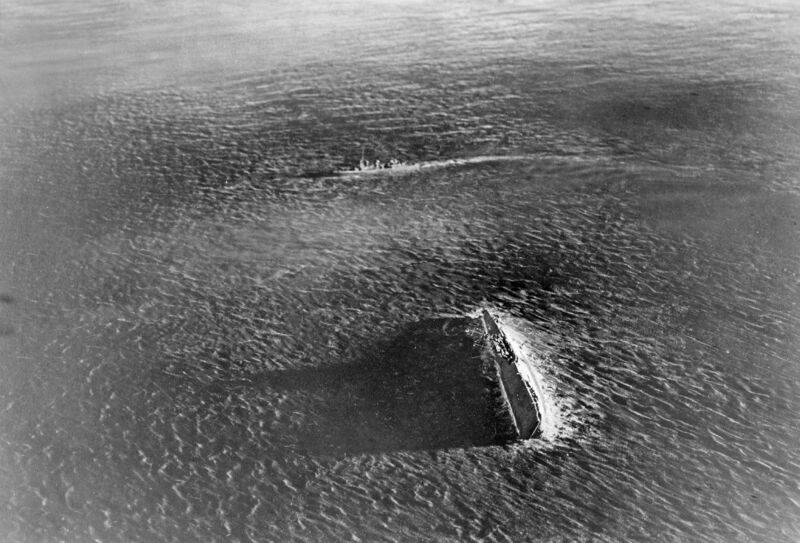 Hammonn’s crew scrambled to survive her sinking within two minutes. 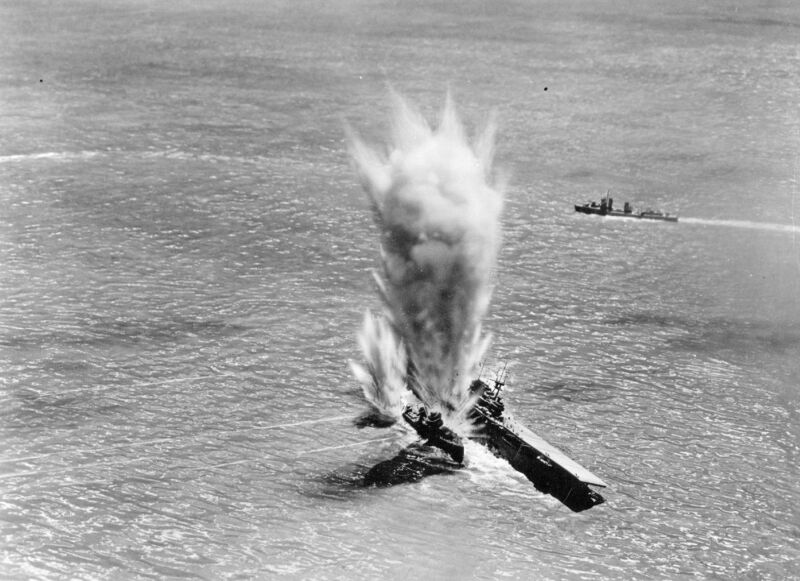 Yorktown’s salvage crew and equipment is savaged by the strikes causing numerous injuries and disrupting their gains to save the ship. 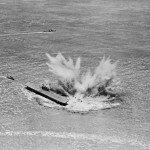 Depth Charges Explode Underwater: As Hammonn sinks at least one or more armed depth charges explode underwater further damaging Yorktown and killing some of the survivors who made it into the water. 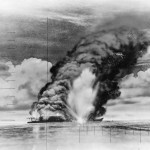 Hammon’s casualties were eighty crewmen lost. 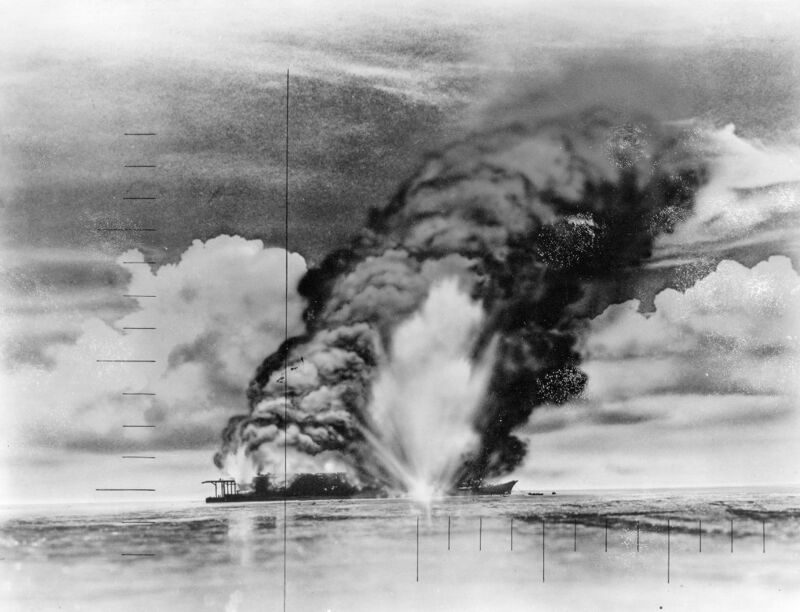 CV-5 Sinks 6-7 at 5-01: With Yorktown’s continued survival in question she was soon abandoned by the salvage crew and taken on board by the tug Vireo leaving CV-5 to again drift through the night. By 0330 on the 7th her list again began to erode and at 0501 she rolled over on her side and sank stern first into 3,000 fathoms of water. 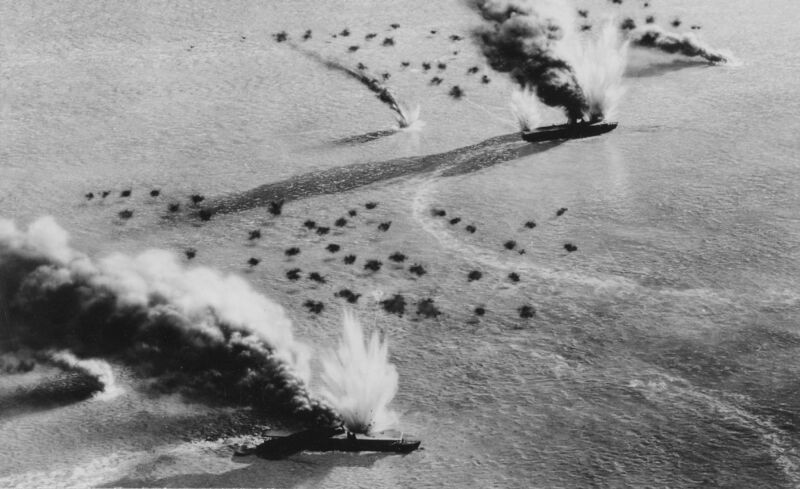 The Battle of Midway was at its conclusion.